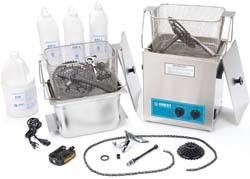 CMR Sales, Inc., the exclusive suppler of Crest Ultrasonic Parts Cleaners to the bicycle industry, is now offering $100 off its newest bike parts cleaner and lube system, the Crest BC1100HT. With its deeper baskets, the Crest BC1100HT system cleans and lubes the new style crank with attached chain rings and bottom bracket spindle thereby saving disassembly and assembly time. The new system features Constant Power Output combined with ceramic enhanced transducers for more powerful ultrasonic cleaning and an upgraded heater which warms the water-based, bio-degradable cleaner quicker. The heater also comes with a lifetime warranty. The new BC1100HT includes carry handles and a removable electric cord for easier transport. In addition, for European IBDs, 220v wiring and plug is available for no extra charge. "The BC1100HT is perfect for the IBD that cleans a lot of cranks," says Greg Infante, President of CMR Sales, Inc., Crest's exclusive distributor to the bicycle industry. "The system's deeper baskets and small footprint makes for effective parts cleaning in very little space. The new HD baskets have a convenient drain position feature. Plus, with ultrasonic cleaning, the parts get cleaner faster than by hand and you also save in labor costs." Three gallons CC400L non-hazardous water displacing lubricant. You can check out the BC1100HT and other cleaning systems on CMR Sales, Inc.'s new website, www.bikecleaners.com.The site, while still under construction, includes information on the ultrasonic cleaning process, IBDs who are already using Crest cleaners, and a price and features list.